I’m afraid to have noticed an unintended consequence of the kosher bug-checking campaign. Rather than checking leafy greens for insect infestation, many Jewish ladies are no longer bothering to check their lettuce at all! Some women have become so vigilant that they aren’t even preparing the greens anymore! An entire generation of children may grow up believing that leafy greens (if they even know the term) refers to lettuce that is pale green and white (and gross!). Now, I know that eating an insect is forbidden in the Torah several times, and I have been as grossed out as anyone else by seeing the blown-up images of the creepy crawlies lurking in my lettuce, but I assure you, it’s not too hard, too time consuming or too disgusting to check your greens. And I assure you, it’s WORTH it! This spring I discovered my favorite new leafy green–swiss chard. It’s stems feature a variety of colors, with red, orange or pale green branching out like veins through the dark, giant green leaves. The colors practically scream at you to EAT ME! Best of all, for the avid bug checker, the leaves are completely flat, and the plant doesn’t grown in the kind of tight bundle (like romaine lettuce) that makes it hard to check. 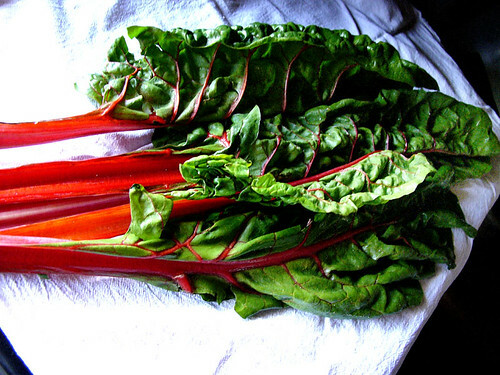 Below is my favorite way to prepare chard. Other easy, yummy greens to check and/or substitute are spinach, baby greens and bok choy. Drain the water with a strainer. Add a tablespoon of butter and sprinkle some kosher salt. You could also add sauteed mushrooms, onions and garlic for more flavor.